Oh, this dress is amazingly cute. You can pair it with anything and turn it into any occasions. You can wear it out to a party, dinner, or going to the beach, pretty much anywhere you want to look fabulous!!! This dress makes me want to twirl around, squealing like a little girl. So, I paired the dress with white Kimono and a white bow belt from Shabby Apple & of coarse some gorgeous eye catching statement necklace, which will surely turn heads from Ox Maison. Statement necklaces are one of my favorite pieces that can add dimension to any of my outfit. Nothing makes an outfit pop quite like a bold, chunky statement necklace. If you’re looking for a statement piece, you cannot go wrong with this necklace. It instantly jazzes up any outfit! Buy and enjoy! Get it now before it runs out! Go to OX|MAISON and find the cutest dresses, tops, bottoms, accessories, and more! You can also find them on Instagram at @shopoxmaison. As always, thank you for reading and stopping by to say hi!! Have a wonderful day! Thank you to Ox Maison for sponsoring this post! Super cute look! you look amazing! Oohh I love the way that dress flows! It seems like the perfect comfy dress, but you can definitely dress it up with that statement necklace. I love it when dresses are versatile! You look so beautiful darling girl! I really adore your style! You are one of a kind! ???? SO STUNNING!!! You are sooooo pretty momma (did I mention HOT too) and I love this dress on you! It screams SUMMMMER!!!! Such a CUTE summer staple! And I have to say, you have a beauuuuutful smile ❤️❤️❤️? Loving this look, Len! Love the addition of that fringe bag, totally screams TEXAS cool with a hint of downtown chic.. Fabulous mix! Stay gorgeous always!! Adorable dress! I love the ruffled hemline! Love all your looks! That dress is SO adorable! Could you do a tutorial on how to take good photos? Your photos has work of art and very natural. I love them all! Stay happy and BLESSED! ??? Thanks girl! have a wonderful weekend! Your blog is FABULOUS! Love this dress. Looks comfy and chic. Thanks for sharing! GORGEOUS DRESS! GORGEOUS MODEL! FABULOUS BAG! AWESOME BLOG! Aaaw Len! That Kimono took this whole outfit to another level! So flowy and gorgeous! Did I mention the fact that you wore that statement necklace like you owned it?? It should really have your name on it! Keep on doing you! You look absolutely amazing! Love the look! You are such a cutie and you look adorable on anything.!! Love this dress. Hey Len! What a cute dress! Perfect for your fringe bag! Pretty look! Love your dress, looks amazing on you! sending you much love & hope to see you on my blog! absolutely loving it…great look sweetie! One word – gorgeous! From top to bottom! I am in love with this dress – the whole look and style of it flatters you completely!!! This dress is so cute Len!! I love those sandals as well!! Hope you had a great weekend!! You look so beauiful in white, I like it dear! Love!! I completely agree with you! That is one fab dress and looks so good on you! And I can’t get over how fierce that necklace is!? I certainly enjoyed this article. 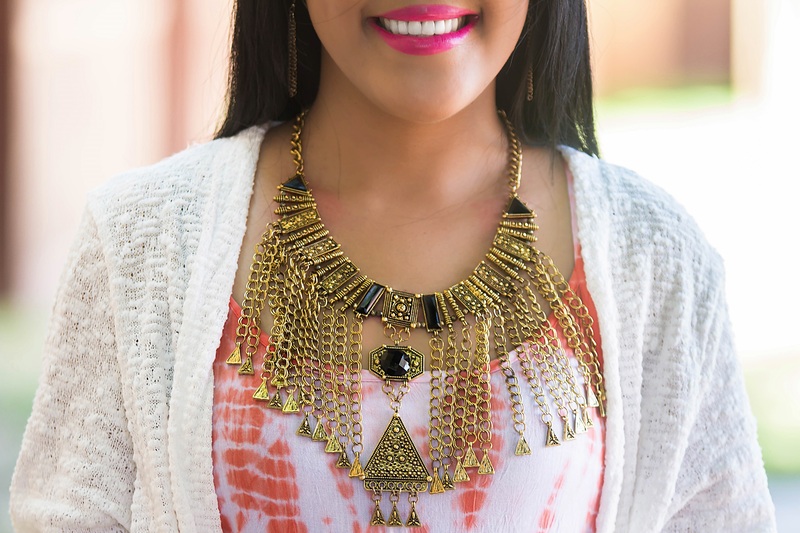 The star of this outfit is eye catching statement necklace. Fun look… love that fringed bag!!!!!! that necklace looks like part of the dress – it’s flawless! Such a cute dress, you look amazing! Love your lipstick too, great colour on you! I love the ruffles on the dress and that bow! How adorable! I’m all about that statement necklace! I’ve never seen one quite like that. You look great girl! Love the chic and simple outfit and that dress is really pretty. Beautiful citrus dress! I love the way you paired it! Have a wonderful rest of the week! Statement necklaces still feel a bit intimidating to me, but I very much love them on others 🙂 . Pretty look and I especially like your sandals (the vibrant nail polish is a great touch)!